The first thing to notice is that the shape of the curves is remarkably similar across all of the companies. Of course the exact proportions of each score are different as each organization has a different NPS® but the shape of the curve is very similar. How’s This For a Response! You can see three clear kicks in the curve at 8, 5 and 0 for all the companies. If you had a normal response curve, those kicks should not be there. So where do they come from? This is the kick at 8 and indicates people that are moderately happy but are not going near the 9 or 10 so they lump together at 8, a good but not great score. Yep if you’re not sure where to place your bet, the middle, 5, is as good as anywhere. You could do better with these folks but they’re not getting too excited today. 0 – I’m Just Letting You Know I’m Really, Really Unhappy! The kick at zero is interesting because if all things were equal the number of people just a little bit less happy than 1’s would be just a little bit lower, in line with the rest of the curve. But it’s not — there are twice or three times as many zeros as you might expect. Maybe they could have given you a 1 or a 2 but not these folks: only a zero would cut it. While it might seem that the bounce in the rate at zero is a negative you should instead view it positively. These respondents are showing that they are still engaged with your organization, even if they are unhappy at the moment. 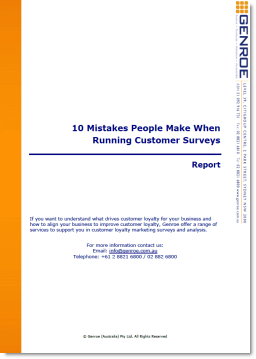 A disengaged very unhappy customer would just have ignored the survey request and moved their business elsewhere. On the other hand the zeroes can be turned around all you have to do is re-engage with them. Now let’s look at the comment rate. Again there is a clear theme to the data for all four organizations. The really good news is that as people are less and less happy they tell you more and more about what you’re doing wrong and how to make it right. Sure a proportion of these respondents are just letting off steam but many of them are sincerely trying to help you. They are spending time, sometimes several paragraphs worth of time, to explain what happened and why they are not happy. At the lowest end of the scale, 80% or 90% of respondents are providing commentary based feedback. If you are an organization that wants to improve its score then this is exactly what you need: Information. Those Zeros are practically begging you to improve. They are still engaged and ready to provide more feedback – so call them. Make sure you set up a proactive service recovery process to contact all of the zeros. Based on our experience with other organisations you will be surprised at how positive the response will be. Of course you’re not going to save everyone but you will save quite a few customers. Plus the calls will not be as confronting as you might expect. After the respondent picks himself or herself up off the floor they will at least discuss the issues with you and give you the opportunity to turn them around. Remember until now all of their feedback has gone into a black hole and no one has ever called them back so you’ve already proven that you’re worth a second chance. Also, when you do turn them around they will become your most loyal and vocal advocates. Do you really want to miss that opportunity? So you see, Zero really is a special number. Are you using it to your advantage? In these data sets there were good volumes of responses (100s or 1,000s), there were also both B2C and B2B organizations. The data were collected in Australia. Agree that those ‘unhappy’ with their experience are significantly more likely to tell you why – and as a matter of fact actually more ‘able’ to tell you. If they are happy it’s much harder to describe why. However, I don’t agree that those giving you a 8 recommendation score (or even those with lower ratings for that matter) are not super happy about their experience. This question is about recommendation not satisfaction. We run many customer satisfaction programs where we ask both overall satisfaction and recommendation, and there is quite a significant number of respondents who are extremely satisfied, but just don’t recommend for some reason. Something we should not forget – recommendation is not always equal to satisfaction. I have glossed over the higher scores in this post as I was focusing on the Zeros and I agree that recommendation is not always equal to satisfaction. In fact “would recommend” does not even equal “did recommend”. You need to be careful when equating these different ideas.